L to R: Tom Grant, Rensselaer County Legislator and Hudson Valley Community College Trustee; Senator Neil Breslin; Neil Kelleher, Chair of the Hudson Valley Community College Board of Trustees; Lisa McKay, Associate Provost and Director of the University Center for Academic and Workforce Development at SUNY; Assembly member Pat Fahy; Kathy Sheehan, Mayor, City of Albany; Roger Ramsammy, President, Hudson Valley Community College; Darius Shahinfar, City of Albany Treasurer; Lucie Marion, Vice President/Executive Director, Educational Opportunity Center; Mark Eagan, Capital Region Chamber of Commerce. Hudson Valley Community College is increasing off-campus offerings in Albany County with the opening of the Albany Center for Education (ACE), located off Central Avenue. The site, at 30 North Russell Road near the Westgate Plaza, has served as the Albany location of the Capital District Educational Opportunity Center (EOC) for several decades. Hudson Valley, which administers the EOC, decided earlier this year that it was also an ideal location to offer credit-bearing college courses, along with credit-free career training through its Workforce Development Institute. These expanded class offerings began in the fall with more than 200 students now studying in a variety of day and evening programs and courses at the location. The new facility, which encompasses the entire second floor of the building, goes by the acronym ACE, and serves a wide range of educational needs. Last week, the college received state approval to recognize the location as official extension center of Hudson Valley, which will open the door to even more offerings in the future. Hudson Valley enrolls more than 11,250 students in total, with nearly 4,000 Albany County residents attending the college each year. ACE is envisioned as one way to provide resources to them closer to home. ACE has started ramping up its educational offerings this fall. The EOC currently offers English as a Second Language and high school equivalency courses, as well as Certified Nurse Assistant training on site. Tutoring is also available for students enrolled in the EOC, and both EOC students and community members can take advantage of the on-site ATTAIN computer services in the day and evening. College and career services are offered on site as well, and both High School Equivalency (HSE) prep and college prep courses are coming soon. In addition, six new credit-bearing college-level courses offered this fall have drawn 120 students to the site. And the college’s Workforce Development Institute is currently running a training course for those interested in becoming pharmacy technicians at ACE as well. College officials and local representatives gathered at the ACE on Tuesday, Oct. 30, for a formal ribbon cutting ceremony and an opportunity to show off the new facility. 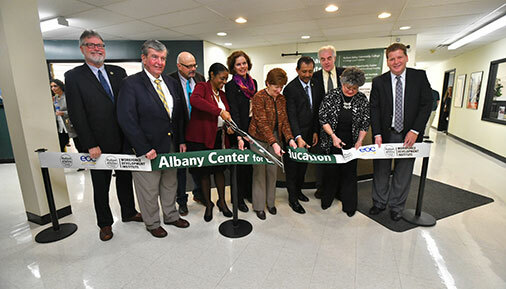 State Senate and Assembly members and Albany City Mayor Kathy Sheehan joined President Ramsammy and Capital District EOC Executive Director and College Vice President Dr. Lucille Marion to formally dedicate the new site. Also on hand was SUNY Associate Provost and Director of the University Center for Academic and Workforce Development Lisa McKay.